View our unusual engagement rings here. Are unusual engagement rings easy to find? Unusual engagement rings are relatively easy to find. You can even make your own. We often make unusual engagement rings and can design a ring based on your design. How are unusual engagement rings designed? First of all, you should consider the personality of the future bride (or groom). You don’t want to design something that won’t appeal to the recipient. Consider the type of jewelry the person likes. Unusual engagement rings should be different but still made from a metal the recipient will appreciate. Do they wear gold? Is most of their jewelry silver? These types of questions should be answered before you get started. If the person loves silver jewelry then they’ll probably appreciate platinum or white gold. After you’ve decided what the ring will be made of, it’s time to pick the setting. Traditional settings are classic bestsellers that are usually chosen by many people. Both the prong and tiffany settings fall into this category. Both contain a central stone, usually a diamond, supported by four or six elevated prongs. Unusual engagement rings rarely use traditional settings. Unique engagement rings rely on less popular settings to set themselves apart from the crowd. For example, a Bezel setting would be a great choice for an unique ring. A Bezel setting doesn’t use a prong to secure the stones. Instead, this type of setting uses a metal ring to hold the stones in place. What else goes into the making of unusual engagement rings? Sometimes it’s as easy as choosing any stone that’s not a diamond. 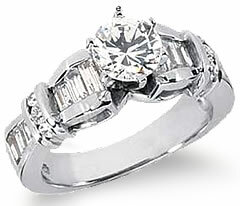 Most people think of diamonds when they think of engagement rings. Unusual engagement rings are anything but traditional, so it’s a good idea to pick an unusual stone. Why not pick a garnet, sapphire, or opal as your main stone? You can then use small diamonds as the accent stones. Another option is to choose a colored diamond. Unusual engagement rings should be unusual, and choosing a colored diamond will help achieve that goal. Colored diamonds allow you to be traditional and unconventional all at the same time. Did you know that diamonds come in many colors? Traditional diamonds are clear, but unusual engagement rings use a variety of diamond colors. Available colors include pink, red, blue, and purple. Another way to obtain a colored diamond is buy one of a lower grade. Lower grade diamonds aren’t totally clear, and sometimes have a yellowish or brownish tint. If price is an issue but you want a colored ring, buying a lower grade diamond may solve your problem. We have diamonds of all grades, so we can help you find the right tint for your unusual engagement ring.